In our homeschool we usually cover all of the main subjects each year. However, I’ve found that 1 or 2 subjects take priority each year. 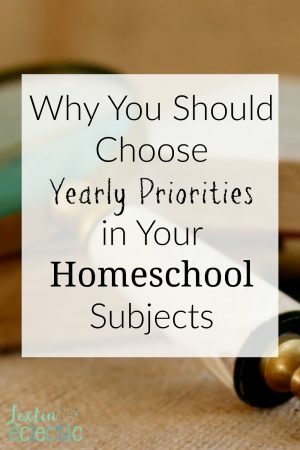 Choosing 1 or 2 subjects as a focus has really helped me feel less overwhelmed with planning. I know that each subject will have a year where it shines as our focus and I feel better about making sure everything is covered in depth through our elementary years. We do cover every subject for each school year, but I budget my time and spend the most time on our focus subjects for each year. It’s important for those busy little people to learn to follow simple directions. If they can master this skill, homeschool life becomes easier. Little people learn best through doing and so I try to make the preschool years as hands on as possible with open-ended art projects (not specific crafts) and sensory bins that allow them to explore colors and textures. I want my little students to develop a love of reading so I try to read beautiful picture books to them so they can enjoy reading with me and start practicing their listening skills. My PreK’ers learn to recognize each of the letters, how to count to at least 10, and to recognize the various shapes. This is the time to introduce the basics while still keeping things very simple. Reading is my first priority with my kids so phonics takes priority during our kindergarten year. Once my kids can read, they are able to do some things independently because they can read simple instructions. So, I try to help my kids be successful with reading as soon as they are ready and we start with a solid phonics foundation in K.
I also start teaching my kids how to write each of the letters using the white board and colored markers. It is nice when a child can complete an assignment without your help because they can read the instructions and copy or write the correct answer. In this year, we start slowly with math by introducing simple math concepts with a focus on basic addition. My kids receive a solid foundation in phonics in K so in first grade we spend more time on math and making sure they understand addition and subtraction. We do lots of hands-on learning to visualize the math facts and memorize them. In this year, we lay the foundation for later math skills. We also begin some spelling and learn simple grammar concepts like the parts of speech. Previous phonics skills are reinforced and a few new blends are introduced as reading skills are practiced daily. In this year, my kids are reading independently and are ready to start learning and applying some spelling rules. I’ve found that my kids are not ready to spell independently until they have begun to read with some fluency. So, we save focus on spelling rules after giving them time to practice reading in the two previous years. Grammar is also a focus in this year as we build on the parts of speech we learned and start to analyze sentences. This is a foundational year as we start learning grammar rules in preparation of writing our own compositions in later years. In second grade we don’t learn numerous new math concepts, but instead practice addition and subtraction with larger numbers. So this year is spent practicing math skills and reading together. This year is the time for a new skill – writing. Now that my children have a foundation in reading, spelling, and grammar, they are prepared to start writing their own sentences and very short compositions (or narrations). In 3rd grade we integrate the skills they have learned into our focus of learning to write. We also learn some new math skills of multiplication and division as well as some simple fractions. In 3rd grade we build on our math foundation with multiple new skills. Spelling and grammar are reinforced through writing. So what will our focus be in 4th grade? That remains to be seen but I have a feeling that foreign languages will be a large focus that year with lots of Spanish and beginning Latin. Did you notice that science and history are not a major focus in our early elementary years? We do cover those subjects each year but I spend less time on them when compared with the basics of phonics, language arts, and math. I plan to have a greater focus on those subjects maybe in 5th or 6th grades as we start preparing for high school level work. Formal literature study and poetry study will also sneak into our schedule as will a study of logic.